One of my goals in publishing this blog is to provide you with family-friendly food that fits the busy lives we all lead. I have a repertoire of meal plans that are super easy to make, but full of flavor. As the primary cook in the Just One Donna house, I am often tired by meal prep time from a day full of activities. While I no longer work outside the home, when I did, I needed quick, easy dinners that would satisfy my family. This oven-baked BBQ Pork Chops with Southwest Vegetables is one of those dinners that satisfies my need for easy preparation while being substantial and flavorful. That means this dinner will work for bloggers and other busy people, no matter what leaves you time-challenged. You'll need about ninety minutes from start to table with this recipe. Most of that time is oven cooking time. I also like to think about cleanup as I plan my meals, For this dinner, I will use a frying pan for browning the pork chops, a ceramic baking dish, and an aluminum baking sheet that gets covered in aluminum foil. That means cleanup is a breeze. Preheat the oven to 350 degrees F. Heat the oil in a large skillet over medium heat. Season the pork chops with salt and pepper. When the pan is hot, add the pork chops and cook until browned on one side. Add the sliced onions to the pan. Season the onions with salt and pepper. Turn the pork chops and season with salt and pepper. Cook the onions until softened. When browned on both sides, remove the pork chops from the pan. Prepare your baking pan for the pork chops with a thin layer of BBQ sauce, evenly distributed on the bottom of the pan. Place the browned pork chops on the BBQ sauce. Spoon additional BBQ sauce on top of the pork chops. 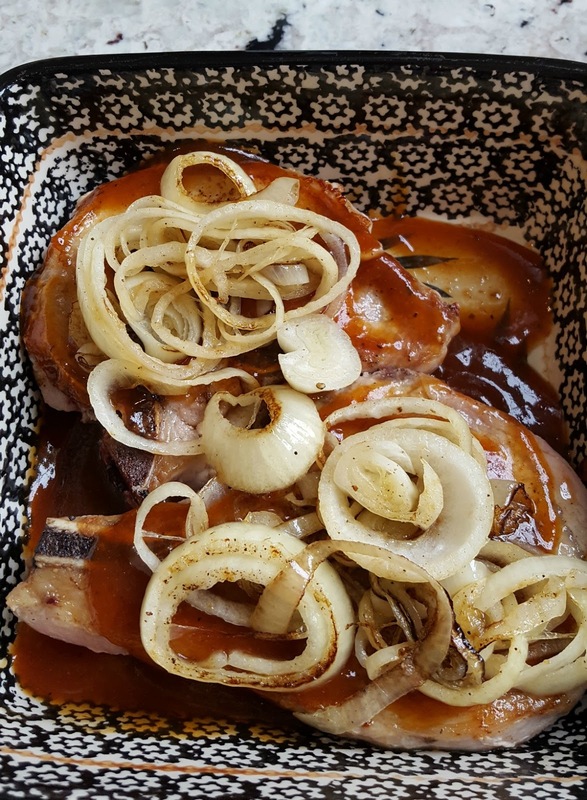 Top each of the pork chops with the softened onion. Drizzle with additional BBQ sauce. Cover the baking dish tightly with aluminum foil. You want to contain the steam while the pork chops cook, making them juicy and tender. Bake the pork chops for one hour. Southwest seasoning is essential to this side dish. I always have this seasoning on hand. It is essential in my kitchen, so I suggest you make some ahead of time. I think you will love it as much as I do. Prepare the vegetables and place them on the aluminum foil-lined baking sheet. 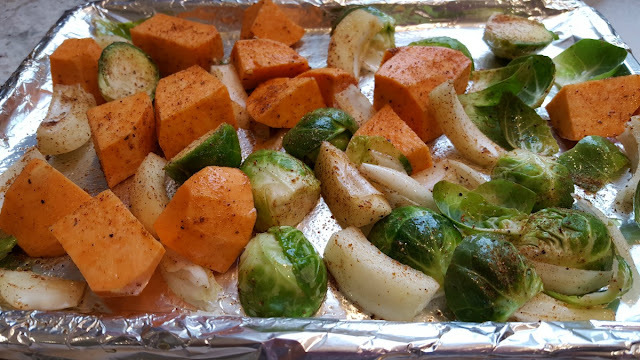 Make sure your baking sheet is large enough to spread out the vegetables. Sprinkle olive oil over the vegetables and toss with your hands, making sure all the vegetables are covered with the oil. Next, sprinkle the Southwest seasoning over the vegetables and toss once again, using your hands. You want the vegetables to be well-covered with the Southwest seasoning mix. 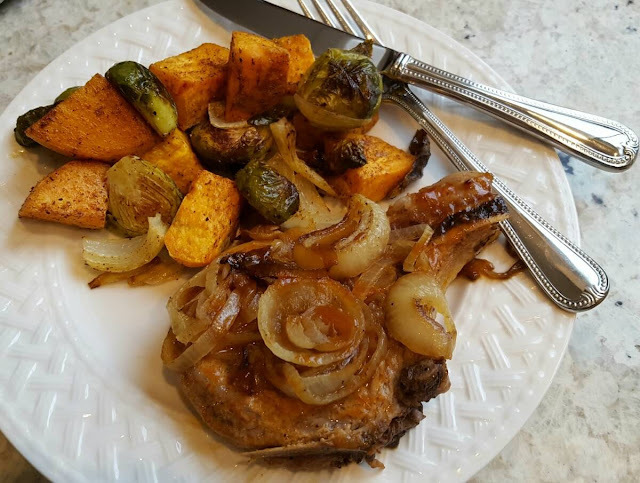 Place the vegetables into the oven with the pork chops, thirty minutes before the pork chops will be finished baking. 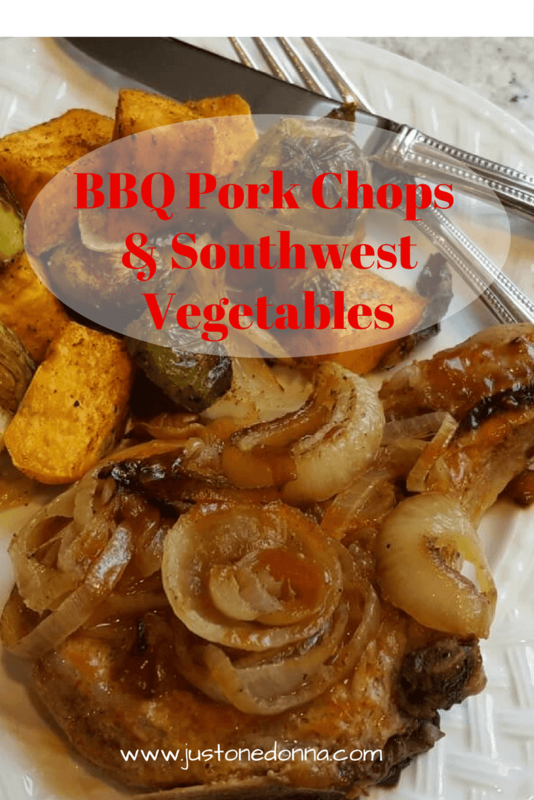 The pork chops and the vegetables will be ready to serve at the same time.